Sometimes it's hard to get off the computer and do what I really enjoy: making things my hand! Here are a few things that I finished recently. A few new sets of glass pebble magnets for Shana's Shop. And do you remember these? I posted about them here. 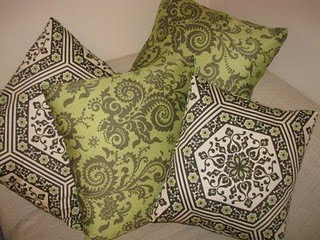 I had some left over fabric from my pillows which I used for my new fabric basket. 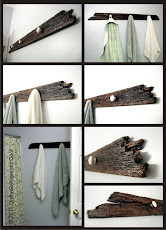 I love it and have found it very useful! I first saw the fabric baskets on EverythingEtsy and then posted about them here. The tutorial which is here came from Christina at The Sometimes Crafter and when I told her that I was going to try these she wrote to me and told me about leaving the opening in an inside corner instead of the top as she originally put in her tutorial. She told me she was going to update her tutorial but hadn't had a chance yet. It was great advice and worked out perfectly. It helps give the top a smoother uniform finish just like she said it would. I've been using my little fabric box on my desk since I finished it and it has stayed full and has been very useful. I had to empty it out to get some photos so you could see the inside. Since I used scraps from the my pillows I actually only had to buy the batting. The only problem is now I have batting left over and need some more fun fabric to make another one! Oh, and also a new sewing machine because mine is broken! 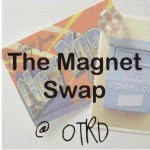 Oh, and one more thing, are you looking for a swap? I just started a Magnet Swap. If you want to be part of it please check it out here. Very, very cute! You've been busy! What is wrong with your sewing machine? What is it doing? I would be lost without mine~! Oh, and I already had the business cards--I got them at Vista Print, and have used that design for several years. The labels were made custom for me to match the business cards. I love them! The fabric baskets look fantastic! Those magnets are beautiful, great job!! Your magnets look great. Good luck with the swap too. Debbie! These turned out so stinking cute! I just LOVE your style! That basket is awesome!!! The magnets are super fun, too! i'm convinced everything looks good if the fabric chosen is fantastic (and i don't mean to sound bad) ... and your fabric choices are brilliant. I like those fabric baskets. Very cute and stylish. Your crafts are so unique & beautiful! What great projects. I've been wanting to do some fabric baskets myself. Those magnets are so much fun! 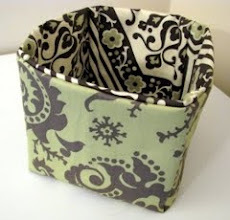 Love the basket idea too and the fabric you used. Thanks for tweeting about the gift card giveaway on my blog! Hope you're having a good weekend. Great Projects! You are very talented! I am an architect, an artist and a world traveler. Out to see what will happen today.